Welding is a trade that requires intense training and many years of mastery. Even then, it is a dangerous job to undertake because of the immense heat and pressure that is required to fasten two pieces of metal or thermoplastics together. According to Industrial Safety and Hygiene News, one out of every 250 construction workers will die from welding injuries over a lifetime of working. 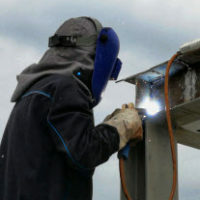 If you have been injured during a welding project at work, you need to contact a West Palm Beach lawyer who can help you through the workers’ compensation claim process. Electrical Shock – This can lead a variety of injuries such as broken bones, seizures, lung failure, cardiac arrest, and even death. Even a small electrical shock that doesn’t show immediate symptoms could have caused undetected internal damage that should be evaluated by a doctor. Asphyxiation and Explosions – Other types of injuries that pose a particular risk to welders include asphyxiation and explosions. We strongly encourage you to contact an attorney at once if you were injured on the job as a welder or construction worker who suffered a welding injury. The compassionate and professional West Palm Beach attorneys of the Celeste Law Firm will aggressively pursue the workers’ compensation that you deserve. Do not hesitate to call us today at 561-478-2447 to schedule a free initial consultation with an experienced West Palm Beach lawyer.